Nature’s Quick Relief Eucalyptus Oil – for Dogs & for Humans! 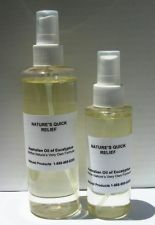 Nature’s Quick Relief Australian Eucalyptus Oil relieves pain in the knees, back, joints, shoulders, hands, neck, muscles, and hips caused by arthritis, chronic pain, injuries or rheumatism. Very effective on both dogs and humans, but should not be used on cats. Australian Eucalyptus Oil soothes and penetrates the skin to bring quick relief to inflammation sufferers. Rubbed onto the skin, eucalyptus oil stimulates blood flow and generates the sensation of warmth. It soothes the underlying pain and discomfort, bringing relief from muscle aches. Click here to order Australian Eucalyptus Oil! Because of its germicidal value (the strongest natural germicide known), Eucalyptus Oil is a powerful disinfectant for burns, cuts and abrasions and is quite effective when used for cold sores and other skin irritations. Also helps to repel fleas and to heal rashes, insect bites, minor burns and sunburns, sores, cuts and abrasions. The tannins found in eucalyptus have astringent properties that reduce mucous membrane inflammation of the upper respiratory tract. Eucalyptol, the chemical component of the oil, works to loosen phlegm. This makes it very effective in helping to clear up head colds, sinus, headaches, hay fever, nose congestions, breathing problems caused by asthma, chest congestion, bronchitis, laryngitis, coughs and emphysema. This amazing oil can also be used as: a dog wash, a mouthwash, and a floor wash. Read below to find out even more uses! Nature’s Quick Relief Eucalyptus Oil is a specially blended formula containing the purest Australian Eucalyptus Oil. Also contains the following carrier oils which aid in absorbability: Vitamin E, Jajoba and Grapeseed Oils. Available in 4 oz. or 8 oz. spray containers. Eucalyptus Oil has been used by the Aborigines in Australia for hundreds of years to relieve pain, clear lungs from congestion, especially in children, and for relief of irritation from insect bites, burns and minor skin irritations. In the 1700’s, doctors John White and Dennis Cossiden, used the oil for treating chest congestion and colic. Later in the 1800’s, a german doctor, Colez, started using the oil as an antiseptic and for bacterial conditions. Doctors Faust and Homeyer also concluded that the oil was a sudorfic, stimulant, anticaterrhal, and an astringent. It was used for virtually all respiratory problems, such as flu, bronchitis, asthma and persistent coughs. eucalyptus oil as “Mother Nature’s Very Own Formula”. Wash area with warm water and for fastest relief, hold a warm wash cloth on the sore area to open the pours. Spray the oil and massage as you do a liniment or body rub. At first sign of discomfort, rub on chest and neck. Then sprinkle a few drops of Australian Eucalyptus Oil on a cloth or tissue and breathe in through the mouth, exhaling through the nose. Do this several times, but only once or twice for small children or pets. Children over 6 and older, inhale three times. The vapors may cause your eyes to water or cause you to cough. This is normal and will pass. and exhale through the mouth. Apply directly to the affected areas with a cotton tip swab. Use several times a day. If used early enough, the oil, in most cases, will stop the cold sore before it breaks the skin. Spray onto the affected area. Do as often as needed, several times a day. Spray immediately to the burn and let dry. If applied early enough, the Oil may prevent blistering. Spray Oil directly to the affected area. Apply through the bandage as it will cleanse the wound and stop infection. Use each time you change the bandage. Give your sauna a fresh, clean, country smell by adding some Genuine Australian Eucalyptus Oil to the water for splashing on hot stones or around sauna. You will find it helps clear your head and makes breathing easier. Adding one or two teaspoons of Eucalyptus Oil to bath water is very invigorating and gives a feeling of well-being. A teaspoon of oil in a foot bath gives excellent relief. Can also be used in Vaporizers for easier breathing. Rub on to ankles and wrists to repel insects. For an effective flea repellent, soak pet collars in eucalyptus oil and allow to dry until just damp before putting it back on. You can get quick relief from the pain of insect bites by applying Eucalyptus Oil to sore and swollen areas. Repeat if necessary. For spraying, mix 1/4 oil with 3/4 water. A warming soothing liniment that helps get muscles loosened and ready to go. Massage Genuine Australian Eucalyptus Oil on to muscles until a warm glow is felt. If desired, mix oil with olive or baby oil. Add a teaspoon of Eucalyptus Oil to the water when washing floors. It’s great for cleaning and deodorizing. Many users have reported that a little eucalyptus oil added to water when washing a dog is a highly effective method of getting rid of fleas. Other dog owners have reported Eucalyptus Spray is excellent for freshening and deodorizing pet quarters. Clean and freshen by adding a teaspoonful or two of Australian Eucalyptus Oil to each load of laundry. Ideal for work clothes, overalls, sportswear, socks and diapers. Add 1 teaspoonful Eucalyptus Oil and 1 to 2 squirts of any Dishwashing Detergent.